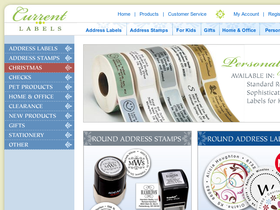 Current Labels, online at currentlabels.com, offers a great selection of home and office labels. Current Labels carries the current and classic styles in address labels, address stamps, personal checks, pet tags and collars, luggage tags, personalized memo pads, notepads, personalized pencils, stampers, label dispensers, stationary, and more. With their selection, Current Labels makes it easy to stay organized in style. But before you shop for gifts for friends, co-workers, family, or yourself, get all the latest currentlabels.com discounts, Current Labels promotions, and Current Labels coupon codes found here at RetailSteal.com. Current Labels ships within the United States, including APO, FPO, Puerto Rico, Guam and the U.S. Virgin Islands. Current Labels offers standard shipping via USPS based on order total. See site for more information. Save 20% on every purchase form Current Labels. Click here to shop and use coupon code to save. Save up to 50% on items in clearance at Current Labels. Click here to shop and save on labels and more. Save 15% on any order from Current Labels - click link to shop and use coupon code to save on personalized address labels, notepads, pencils, and more. Save $1 on any order from Current Labels when using this coupon code. Click link to shop and save. Shop online at Current Labels today and enter our coupon code at checkout to enjoy $5 savings on your purchases of $25 or more. Shop for personalized labels and stationary starting from only $6.95 from Current Labels. Click link to shop the selection. Save $2 on your Current Labels purchase when you enter this promotional code with your order! Save $2 on your Current Labels purchase of roll labels when you enter this promotional code with your order!